Laurie Strode: [walking around the hospital] I-I need something for my head! Laurie Strode: [yells out] HELLO? More dialogue with Laurie and the psychiatrist. Laurie looks at a framed inkblot on a wall and says that it looks like a white horse. Q: Will Rob Zombie return for "Halloween III"? Q: Does Deputy Neale die ? Q: What is Weird Al doing in this movie? In my review of Quentin Tarantino's "Inglourious Basterds," I wrote that those put off by "Death Proof" would also likely be put off by his latest. Go figure that one week later, I am applying the same notion to Rob Zombie's sequel to his 2007 remake of "Halloween." One of the most heatedly derided remakes to date, I found Zombie's take impassioned and sincere while transcending John Carpenter's minimal, workmanlike low-budget-horror-flick terrain. While not a perfect film, "Halloween" epitomized (to me, anyway) the creative potential of the remake when placed in the right hands. "Halloween II" finds Zombie returning to the Michael Myers maelstrom while tightening already-established character arcs, employing a harshly gritty style (courtesy of DP Brandon Trost), and topping it all off with a heapin' helpin' of carnage. 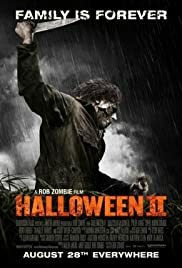 Whereas "Halloween" focused on the inception and evolution of Michael Myers (Tyler Mane) from a murderous youth to the hulking masked madman we all know and love, Zombie's thematic focus this time out is "family" (and its many incarnations), using the traumatized character of Laurie Strode (Scout Taylor-Compton) as its axis. Picking up one year after the fateful night her brother decided to come home, Laurie has become a punked-out version of her former virginal suburbanite self, and now resides with Sheriff Lee (Brad Dourif, sporting a Ted Nugent hairdo) and Annie Brackett (Danielle Harris). Meanwhile, the Eve of All Hallows is looming over Haddonfield like a shadowy blanket, with a rejuvenated, hooded-angel-of-death Michael Myers making a pilgrimage back home, guided by the specters of his younger self (Chase Wright Vanek) and his mother, Deborah (Sheri Moon Zombie). In the meantime, Dr. Sam Loomis (Malcolm McDowell) has become a pop-psychology celebrity, authoring yet another book on his last run-in with the notorious Myers. With "Halloween II," Zombie drops the slick, polished look of the initial film, replacing instead with dark, grainy stock punctuated by flashes of neon and the soft focus of black & white. In many ways, the director has created a film that, like his characters, is schizophrenic in its style, cleverly threading complex dream sequences into reality, and cutting away from scenes with little warning. While the employment of dream sequences in most films is a cheap tactic for a "GOTCHA!" moment, Zombie keeps his motives ambiguous: do the dreams represent a psychic link between Laurie and Michael? the erosion of Laurie's sanity? Michael's distorted concept of pilgrimage? Either (and every) way, they give the proceedings a richly layered psychological weight that, in addition to their shock value, make us feel that the characters each have something at stake. The events leading up to the brilliantly-staged climax are both unpredictable and surprisingly affecting. Unlike the "Saw" sequels (which have become the bane of the discriminating horror fan's existence), bathed in a hypocritical morality amid all the twisted flesh, spilled blood, and dungeon locations, Zombie is cognizant of death as something horrifying and destructive--the murders in "Halloween II" are played straight, executed with a fury that is disquieting; Myers has become a driven beast whose path of destruction possesses a joyless, workmanlike quality, removing any potential glamorization from the act. Every flesh-tearing slash, every helpless scream, cuts to the bone. Quite admirably, Zombie uses his second go-'round with Myers as a chance to tie up character arcs and plot threads that felt truncated in the over-ambitious "Halloween": Loomis, who seems detached from most of the main plot, is given a chance to redeem his greedy, bottom-feeder ways; Sheriff Brackett gets to exhibit a paternal side, but also an authoritarian mentality once the code of law is broken (he has several great, emotionally wrenching scenes near the end of the film); as Deborah, Sheri Moon Zombie's detached, trancelike performance is apt for the physical manifestation of the voice guiding a psychotic mind. Amid the carnage of his corpse-strewn landscape, Zombie's interest in character interaction and moral ambiguity gives "Halloween II" a depth that, for those with the stomach to take it, is downright refreshing. 114 of 213 people found this review helpful. Was this review helpful to you?